As reported earlier Korean car maker Hyundai Motors is going to bring the facelift version of its sedan Verna soon in Indian car market. It is now reported that spies have witnessed the facelift Verna uncovered for the first time being tested on Indian roads. 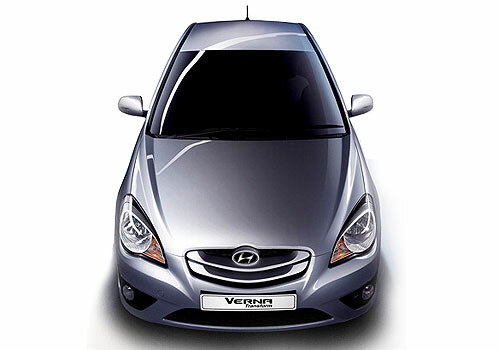 The facelift Verna is already being sold in Russia and China. According to reports received from spies the new Verna will bestow newly developed bumpers for both front and rear ends followed by reflectors integrated on them, fog lamps with LED DRLs and new alloy wheels. As far as interiors of facelift Verna are concern it will continue with the same existing treatment and the only change that would be introduced is introduction of seven inch touchscreen navigation system. As far as the engine configuration is concerned it is speculated to continue with the same existing engine configurations of 1.4 litre and 1.6 petrol and diesel engines respectively. The petrol variant would be empowered with five speed manual gearbox while the diesel variant will embellish six speed manual gear transmission system. The facelift Verna is expected to offered with price tag varying from Rs. 7.50 lakh to Rs. 11.50 lakh and would compete against recently launched Maruti Suzuki Ciaz, Honda City and Volkswagen Vento. It is speculated to be launched in Indian car market sometimes during the first quarter of next year.